For the past several years, I have been drawing sad objects and sad people saying sad phrases. Apparently, luring friends to my place under the guise of “hanging out” and then forcing them to flip through my sketchbooks of sad cartoons got annoying after a while (and perhaps I also made some question my mental stability). Hopefully, now I can just post my cartoons online and trust that people will look at them without my anxious gaze upon them, pleading with them to laugh at each one. For my first post, I thought I would share one of my earliest, and favorite, sad drawings. 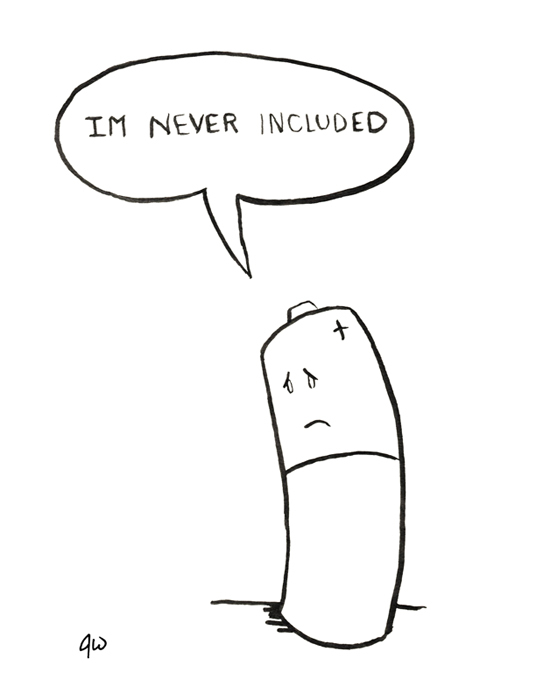 So perhaps I am this battery… never included. This entry was posted in Uncategorized and tagged battery, josh wood, sadsadsad. Bookmark the permalink.